This entry was posted in knitting and tagged 2010, booty club, emerald city, FO, knitting, socks, socks from the toe up, superwash merino, yarn pirate by barefootrooster. Bookmark the permalink. Hey it was totally worth it to lose some sleep to finish these! And the ginger yarn is a great color – those socks will be great. Go you! Woo! Those socks are great! And like Lisa said, totally worth missing some sleep for. Yippee for finishde socks!! The no-picking-up-stitches and the no-grafting are the reasons that I so love toe up socks!!! I may occasionally do a cuff down, but my heart belongs to Wendy! Love these! I’ll have to try the gusset, toe-up heel on my next socks. I’ve got a plan for some koigu, striped knee socks in the works. Very nice! Thanks for the review of the short hiya-hiya needles — I’ve been curious about those. Love the socks and the color. 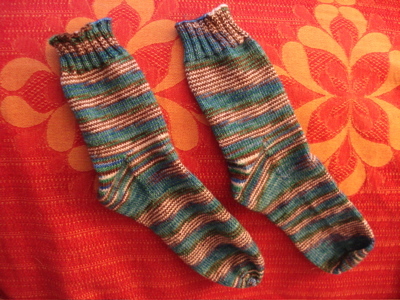 I just did a gusset heel, toe-up sock myself. That heel was like an awakening moment for me – so much easier than what I had been trying to do. Now I’m hooked, have to hurry and finish this pair so I can start another. Happy knitting! !